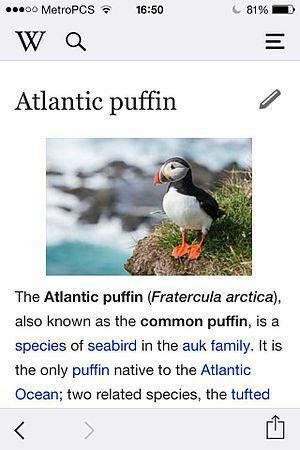 Wikipedia has today made a significant update to its iOS application, which most noticeably features a cleaner, “distraction-free” design, as well as the ability to edit Wikipedia articles from your smartphone or tablet device. Under the hood, the app received a number of other improvements as well, including speed increases, offline access, a reading history, and more. The changes on iOS follow the launch of a similarly revamped Android app, which rolled out last month. Today, some users don’t think of accessing Wikipedia via a native application on their iOS devices, especially because Apple’s mobile operating system includes integrations with the online encyclopedia. In iOS 8, this also allows users to search and read article snippets directly from the iOS interface itself, via Spotlight. Meanwhile, the Apple App Store offers a large number of third-party Wikipedia clients, many of which include offline access as their differentiating feature. With the revamped app, however, readers may see less need for those third-party experiences, it seems. Also noticeable is the new look, which more heavily emphasizes the actual content, while the navigation, search, and sharing features are less obtrusively displayed. Most importantly, perhaps, is that Wikipedia iOS users can now edit articles from their phones or tablets, even if they’re not logged in. This feature first arrived on Android, and is also something that the third-party apps don’t currently offer. And finally, Wikipedia has partnered with network operators around the world to provide its content free of data charges through an effort known as “Wikipedia Zero,” which focuses on delivering access to this resource in developing and emerging markets. The new app is live now here on iTunes.